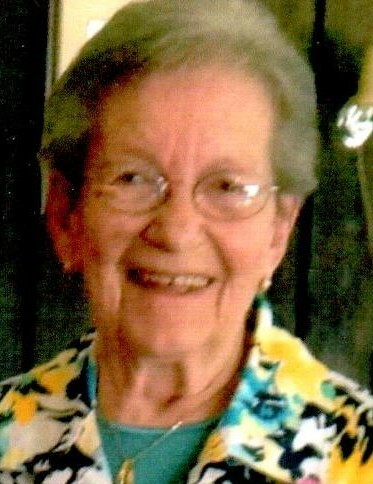 Kathleen J. Ressie, age 93, of Minnesota City, passed away on Monday, March 25, 2019, at her home. She was born on March 20, 1926, in Mount Vernon Township, MN, to Lloyd and Alice (Hilke) Schumacher, and was a graduate of Lewiston High School. Kathy was united in marriage with George E. Ressie, Sr., on September 26, 1944, at Hebron Moravian Church in Altura, MN, and he preceded her in death on November 13, 2005. Kathy worked alongside her husband on their farm, and as an outgoing people-person, she enjoyed working for many years at the Happy Chef Restaurant in Winona, and later with Hy-Vee. She was a member of Grace Evangelical Lutheran Church in Stockton, and its Ladies Aid. She will be remembered for her strong work ethic, and for her enjoyment of gardening, fishing, and doing ceramics. Kathy is lovingly survived by her children: George “Butch” (Joyce) Ressie, Jr., Lewiston, MN; Diane (Jerry) Rau, Elgin, MN; Cindra (Richard) Andolshek, Minneapolis; and Roxanne (Bob) Wold, Minnesota City; grandchildren: Todd (Colene) Rau, Plainview, MN; Traci Rau, Elgin, MN; Vikki (Dave) Rothmeyer, Forest Lake, MN; and Lisa Horman, Onalaska, WI; 7 great-grandchildren; 1 great-great-grandson; brother: Glen (Helen) Schumacher; sister: Dixie Maus; a sister-in-law: Marcella Schumacher; as well as other relatives and friends. She was preceded in death by her husband; grandchildren: Bradley Rau and Bobby Ressie; brother and sister-in-law: Ray and Florence Schumacher; brother: Gene Schumacher; brother-in-law: Jack Maus; and a brother-in-law and sister-in-law: Clarence and Doreen Ressie. Visitation will be held from 12:30 PM until the funeral service at 1:30 PM on Sunday, March 31, 2019, at Grace Evangelical Lutheran Church in Stockton, MN. The Reverend Bruce Stam will officiate. Following the service, cake and coffee will be served for a time of fellowship at the church. Kathy will be laid to rest in the spring at Oakland Cemetery in Stockton. Memorials may be directed to Grace Evangelical Lutheran Church in Stockton. Online condolences or memories may be left for Kathy’s family at www.watkowski-mulyck.com.